I have to share about a favorite curriculum! (No, I didn't pay him to say that last part, isn't he sweet?!) I agree that it's effective; every week I am noticing more words that my kids are spelling correctly in their writing that they didn't know how to spell before. Not sure if you can read what Zach spelled on the board: I'm done with my book! We were both so proud! The book is open and go, the lessons are all laid out. We work for about 15 minutes & then pick up there again the next day. I spent one day getting ready to teach it by punching out the perforated cards & just glancing at the book. Otherwise there is really no prep time. 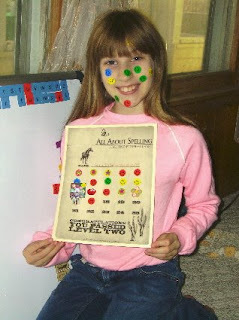 Here's Anna after finishing another lesson, with her progress chart. Obviously she loves "sticker day," LOL! Review is built in so it won't be forgotten, and my kids retain what they are learning. It's completely customizeable--the rules and words are on cards that you keep in a card file, and when your kids have them mastered, you move the cards out of the review section. 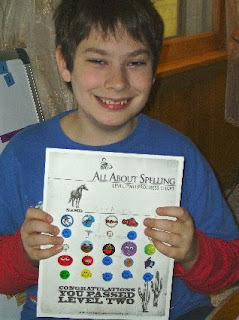 Zach and his progress chart, done with Level 2! There is a great Resource Center on the site with articles and videos for further help. 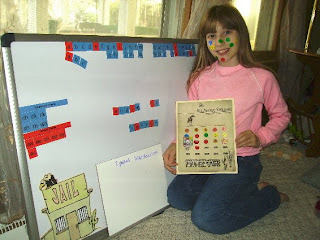 We added magnets to the "jail" so we could put that on our board too! BTW, the board is 2' X 3' if you're wondering--the angle of this picture may make it look bigger. AAS is easy to use and to understand. I only wish I had found it several years ago! I really can't think of much I'd change about it, and I've found that the author is very accessible and helpful. It might not be the program for everyone, but if you're looking for a better spelling program, check it out. I decided to become an affiliate because it's helped us so much. If I can answer any questions I'd be glad to. 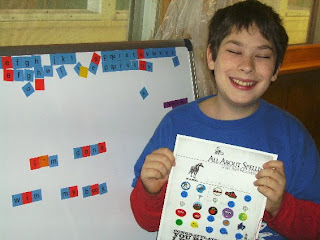 (I've been talking up AAS since before I knew they had an affiliate program because it made my kids enjoy and understand spelling. We're midway through book 2 and will start book 3 later this year.). 1/6/09--I thought I'd add an update to this post, and some pictures! My kids still enjoy this, and their writing has improved so much. They can spell more words and if they do make a mistake, usually the mistake makes phonetic sense--no more simply "decorating with vowels" or adding extra letters because the word might need more! They have a lot more confidence now and both have told me that reading is more fun too. I think AAS has helped with word-attack skills for bigger words, as well as helping with their speed. Zach actually read a huge Indiana Jones novel (with all four books in it). Back in September he told me that the first chapter in one of the books didn't make sense and didn't belong. After discussing how that couldn't be true, he put the book up for awhile and re-read it in November--and told me that now he could read it all and that it DID make sense! Zach is now in Level 3, and Anna is nearing the end of Level 2.